Store and dispose of both black and grey water with our Conservancy Tank Solutions. As it is chemical-resistant, conservancy tanks are used to dispose of both black and grey water. It serves as temporary storage only, requiring the waste to be pumped out whenever the tank is full. This is done by licensed hauling companies who dispose of the waste accordingly. Conservancy tank in required size. All conservancy tanks are supplied standard without fittings, as the contents need to remain inside the tank until pumped out. The required volume will depend on how often the tank will be pumped out and the amount of people using the facilities on a daily basis. Lengths will vary based on the installation. This is a guideline for a basic installation. Each installation will vary based on the setup and your personal preference. We recommend using a professional to installation this system. Although conservancy tanks are fairly maintenance-free, there are a few things you can do to ensure that your system functions properly. 1. Ensure that proper installation procedures are followed. It is vital to follow all installation guidelines and manufacturer specifications to ensure proper functionality and reduce maintenance after installation. 2. Ensure lid remains in place. When installing the tank, the lid is filled with concrete prior to use to ensure that it stays closed off. It is, however, important to double-check every now and then to make sure that nothing falls into the tank or no effluent leaks out of the tank (effluent is not safe and carries disease-causing germs). The location of a conservancy tank should be considered and it must be placed on soil with a bearing capacity greater than 120 kPa. If bearing capacity cannot easily be determined, use the provided method of soil classification, which will also assist in determining suitable backfill material. Take care not to damage any underground services (telecommunication, electrical cables, water/sewer pipes, gas lines, etc). If ground water is present in the excavation hole, continuously pump out the water during the installation process. The bedding is the foundation on which the tank will be installed. The type and thickness of bedding will vary, choose the correct process relevant to your setup. Drill a hole in the designated area (see image above) with 111mm hole saw or a jig saw for pipe to enter at the top of the tank. Fit pipe and elbow to inlet and seal with window putty or pan connector sealer to ensure no leakage once final installation is complete. Carefully place the tank on top of the prepared bedding in the designated excavated area. Note the direction of flow (inlet) and place according to setup. NB: the backfill procedure differs based on the size of the conservancy tank used. It is vital to follow the correct procedure to ensure the tank does not get damaged (refer to steps 7 to 8 for more detail). 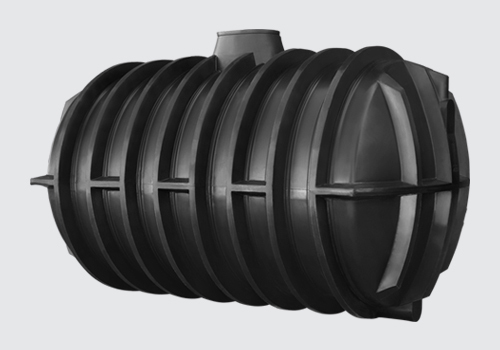 For the 6000lt tank – Fill the tank with 150mm of water, then backfill 150mm around the perimeter of the tank. Compact the layer and repeat the process until at least half of the hole is filled. For the smaller range – Fill the entire tank with water, then backfill in layers of 150mm around the perimeter of the tank, compacting each layer before laying the next. Continue until halfway. Before commencing with the rest of the installation, it is vital to ensure that the soil is properly compacted. Fill tank lid with concrete (allow concrete to cure) and put the lid in place. Connect feed from house (black and grey water) to the elbow extending from the inlet at the top of the tank. Note: We recommend using a local plumber to handle all plumbing requirements. Backfill the rest of the hole with suitable backfill material. Refer to steps 7 to 8 to ensure correct procedure is followed (depending on the size of the tank). We recommend installing a manhole for easy access when necessary. Find a local licensed hauling company and keep their contact details at hand.